Not many people like to see themselves in a photograph, especially those who are at retirement age. 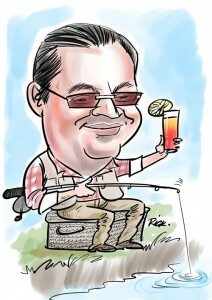 However a caricature painting given as a retirement gift is an 'interpretation' and any unwelcome aspects can be laughed away as 'artistic licence'. They are light hearted but offer an opportunity to celebrate a career and personality. They don't ha ve to be complicated or massively expensive either. 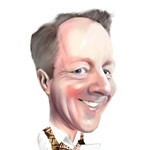 Caricature paintings can contain as much or as little detail as you chose to suit the person or the budget. Whether it's a quick 'So long and thanks for all the fish' or a Star Wars adventure with lego, mercedes benz, smart cars and Back to the Future a caricature painting is a completely customisable. 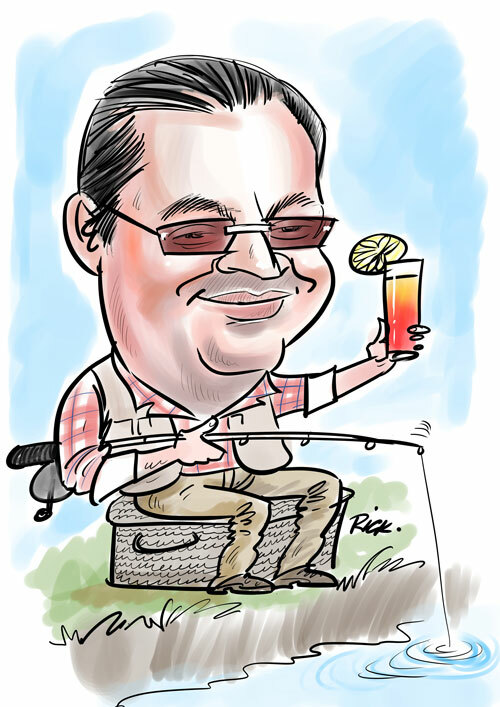 Rick is a highly experienced caricaturist for hire, who works with both traditional pen on paper and digital caricatures on an iPad; either on the spot at your wedding, barmitzvah or corporate event, or from photos that you send in.